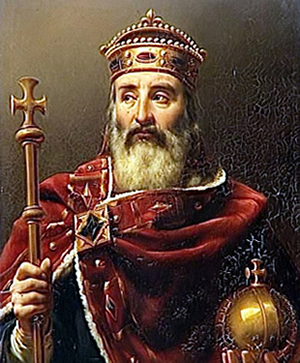 The eastward expansion actually had its beginning in the 8th Century at a time when there were no Germans under Charlemagne. Among his grandchildren Louis, the German, and Arnulf of Carinthia (Kings of the East Franks2), there was a renewed wave of settlement of the conquered territories: the present-day Slovakia and the former Pannonian plain (today's Burgenland, Hungary and Slovenia). The focus was more on economic interests, with proselytizing done in only in some areas. By the Eastward colonization the territory of the German Empire was increased by about one-third. Another large wave of immigrants came at the time of the Teutonic Order. Eastern colonization was brought to a temporary standstill in the 14th century due to the outbreak of the plague. Due to the schism in the 16th Century there were religious wars, pangs of conscience and existential fears, which led to a new settlement movement of mainly Protestant settlers in the east. 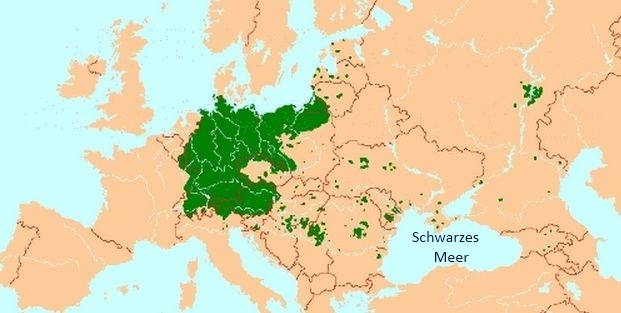 Due to the efforts of Leopold I, Charles VI, Maria Theresa, Joseph II and the Russian Czars (Peter the Great, Elizabeth I, Catherine II, Alexander I) in the 17th, 18th and 19th Centuries, newly acquired territories were settled with Germans in the east, which led to the establishment of German enclaves in Europe. 2The East Franks in the late 10th Century also called the German Empire, is the origin of the Holy Roman Empire of German Nation and the following that, today's (current) nation States: it was comprised of the Federal Republic of Germany, the Republic of Austria, the Republic of Switzerland, the Principality of Liechtenstein, the Grand Duchy of Luxembourg, the Kingdom of Belgium and the Kingdom of the Netherlands.